Tantalum Plate (Ta) is a dark blue-gray metal that is very heavy, ductile and hard and has high corrosion resistance. Tantalum Sheet is especially resistant to chemicals at temperatures below 150 °C and can only be dissolved with hydrofluouric acid. It has the fourth highest melting point of all metals and is able to form extremely thin and protective oxide layers for high-quality capacitors, making it an excellent material for lumps. Because of Tantalum Plate strength and workability, very thin sheets of tantalum can be clad to other surfaces, providing superior corrosion protection and cost effectiveness. Tantalum is often supplied in flat sheets. We suggest that you order to specific widths and lengths that limit the amount of waste in your application. Our Tantalum sheets are used in numerous applications as magnetic or radiation shielding. Such applications range from military satellites to cutting edge medical technologies. Our tantalum 2.5% tungsten plates are designed to survive in corrosive environments, while our tantalum 10% tungsten alloy is designed for high temperature corrosive environments. Tantalum Plate is used in laboratory equipment. Tantalum Plate is used as a substitute for platinum. Tantalum Plate is used in manufacturing super alloys and electron-beam melting. Tantalum Plate is used in metallurgical, machinery processing, glass and ceramic industries. Tantalum Plate is a right material as a superalloy additive in nickel-based alloys. 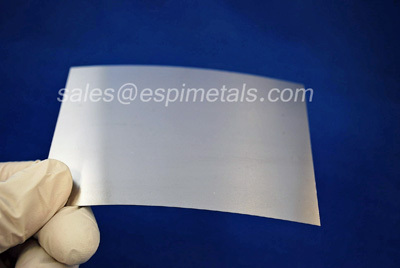 Tantalum Plate is also suitable for sputtering targets. R05400, unalloyed tantalum, powder-metallurgy consolidation. R05255, tantalum alloy, 90 % tantalum, 10 % tungsten, electron-beam furnace of vacuum-arc melt, or both. R05252, tantalum alloy, 97.5 % tantalum, 2.5 % tungsten, electron-beam furnace or vacuum-arc melt, or both. R05240, tantalum alloy, 60 % tantalum, 40 % niobium, electron-beam furnace or vacuum-arc melt. ULTRA76 Ta alloys offer higher corrosion resistance in most environments generating value added by extending product life time, reducing material thickness and improving processes throughput. Tantalum Round Disk Thickness: 0.060" to 0.125"
*Total weight of finished plate not to exceed 350 Ib. .002" x 6" x 12" .040" x 12" x 24" .500" x 12" x 24". .004" x 12" x 24" .050" x 12" x 24" .625" x 12" x 24"
.005" x 12" x 24" .060" x 12" x 24" 750" x 12" x 24"
.010" x 12" x 24" .080" x 12" x 24" 1.00" x 12" x 24"
.015" x 12" x 24" .125" x 12" x 24" 1.50" x 12" x 24"
.020" x 12" x 24" .188" x 12" x 24" 2.00" x 12" x 24"
.025" x 12" x 24" .250" x 12" x 24" 2.50" x 12" x 24"
.030" x 12" x 24" .375" x 12" x 24" 3.00" x 12" x 24"
Sheet is cut to order and sold by the square inch or square foot. Each order is packaged according to the customer’ s standards including preparation for export such as wooden case, pallet or according to customer’s requirement All shipping documentation is provided for Tantalum Plate delivery from mill to customer. We Supply Our Tantalum Plate to various countries like Saudi arabia, Kuwait, Qatar, Oman, Yemen, UAE, Iran, Turkey, Kazakhstan, Greece, Singapore, Thailand, Indonesia, Vietnam, South Africa,South America,Brazil, India, Australia, Egypt.